Premier Kathleen Wynne celebrated the winners of the 10th annual Premier's Awards for Excellence in the Arts at an event at the Art Gallery of Ontario on October 5. 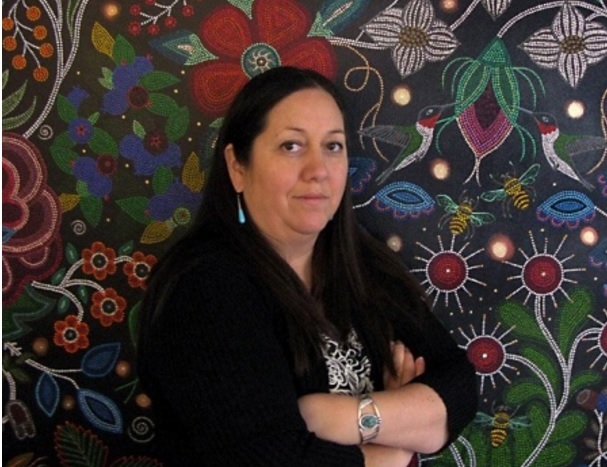 Christi Belcourt, a visual artist from Espanola, Ontario, won the Individual Artist Award. The majority of her work explores the beauty of the natural world. Her large-scale paintings are inspired by the traditional beadwork patterns of Métis and First Nation women. Belcourt’s paintings are found in the permanent collections of the National Gallery of Canada, the Art Gallery of Ontario, the Indian and Inuit Art Collection, Parliament Hill and Canadian Museum of Civilization, First People’s Hall, among other prestigious institututions. Administered by the Ontario Arts Council, the Premier’s Awards are open to artists and arts organizations engaged in professional practice in the province. The winning artist receives a $35,000 prize and selects an emerging artist who receives a $15,000 prize. The winning arts organization is awarded $50,000. Christian Chapman, an Anishinaabe visual artist and filmmaker from Fort William First Nation, was honoured as Emerging Artist of the Year. A Different Booklist, an independent bookstore and literary cultural destination in Toronto, won the Arts Organization Award. After receiving the award, Belcourt stated she would be donating the prize money to Onaman Collective, an “Indigenous grassroots land-based art initiative sharing traditional knowledge and language with youth.” Belcourt co-founded the collective in 2014 with Isaac Murdoch and Erin Konsmo. Belcourt’s father, Tony Belcourt, is the founding president of the Métis Nation of Ontario and was appointed to OCAD U’s Board of Governors in 2012.
stand (or pass?).... anything is dizzyingly possible. The OCADoesTO student group gets OCAD students together to enjoy the culture that Toronto has to offer. A trip to the new Art Gallery of Ontario (AGO) is being planned. To make it fun and festive, participate in Secret Santa and bring a small gift with you (under $5.00) to exchange with someone else in the group! This item should not be food. OCAD Students get into the AGO for free so be sure to bring your OCAD ID card! Please RSVP by e-mail ASAP. Drop in for the AGO's new weekly life drawing sessions with a professional model. Learn and explore at your own pace without instruction in a great studio space. No experience required - everyone is welcome. Bring your own drawing materials. Exploring the experimental energy of an era, Toronto: Tributes + Tributaries, 1971-1989 brings together more than 100 works by 65 artists and collectives to highlight an innovative period in Toronto art history. Amidst the social and political upheavals of their time, the generation of artists that emerged in Toronto during the 1970s and 1980s pushed the boundaries of conventional painting, sculpture and photography, exploring new ways of art making including video, installation and performance. Drawing heavily from the AGO collection Toronto: Tributes + Tributaries, 1971-1989 opens on September 29, 2016, filling the entire fourth floor of the AGO’s Contemporary Tower. The exhibition, which runs until May, 2017, will be accompanied by a live performance series, a film and video festival, as well as satellite installations throughout the Gallery. Organized thematically and punctuated by references to Toronto and its cityscape, the exhibition highlights the era’s preoccupation with ideas of performance, the body, the image, self portraiture, storytelling, and representation. Featured artists include Michael Snow, Joanne Tod, the Clichettes, Duke Redbird, Barbara Astman, Robin Collyer, Robert Houle, Carol Condé and Karl Beveridge, as well as highly influential artists like photographer June Clarke, illustrator Ato Seitu, and dub poet Lillian Allen. This is the first time since the AGO’s reopening in 2008 that many of these seminal works have been on display. Curated by Wanda Nanibush, assistant curator of Canadian and Indigenous art, the title of the exhibition—a reference to the city’s many buried waterways—serves as a visual metaphor for the diversity of the cities art scene and its similarly buried histories. Intended as an evolving display, many of the works in the exhibition are scheduled to be rotated in January 2017. Responding to Art/Design in/with Community: Diversity and Action with Catherine Campbell, Education Officer, AGO, Program Facilitator, Montgomery’s Inn & Artist-in-Residence Greenest City Project & Britt Welter-Nolan, Director of Public Programmes, Myseum of Toronto and former Managing Director of Artistic Projects, Gladstone Hotel, Toronto. Catherine Campbell is a multi-disciplinary artist and educator. She has a BFA from OCAD University in Criticism and Curatorial Practices and a MES (Masters of Environmental Studies) from York University with a certificate in Environmental Education. She currently works for the AGO as an arts educator and for Montgomery’s Inn and Greenest City as a curator and community facilitator. Britt Welter-Nolan is Director of Public Programmes, Myseum of Toronto. She has an extensive background in original content development, curation, participatory design, interpretive strategy, experience design, curriculum development, web based learning, public programming and event planning. She has been an independent curator and art/design educator for a number of years and in such positions as Managing Director of Art, Gladstone, Acting Managing Director - ROM Contemporary Culture and Family Programs and Arts Access Coordinator - AGO. ******* Thanks to the Faculty of Art for supporting this presentation.